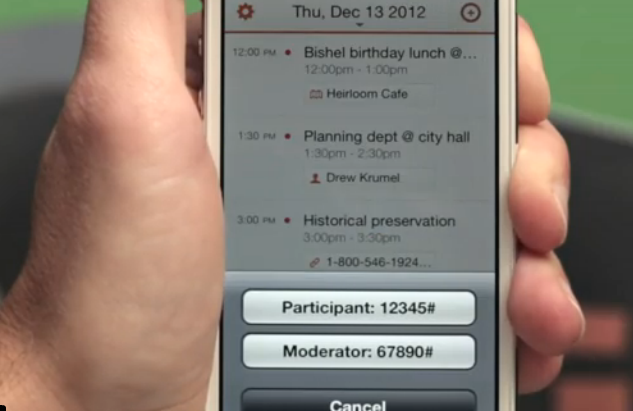 Tempo today launches a smart calendar app, one of the closest things I’ve seen to Google Now for the iPhone. Tempo acts as a personal assistant that makes educated guesses about what information will be relevant. For instance, if a meeting confirmation includes mention of a conference call, Tempo handles the dial-in and pass code. Tempo will also prepare dossiers for upcoming meetings, based on related emails, contact information and LinkedIn profiles. The app checks flight status, links out to driving directions in Google Maps, finds nearby parking, and posts “happy birthday” messages to Facebook. Tempo was incubated at SRI International in Menlo Park, Calif., which is most recently famous for being the birthplace of Apple’s Siri personal assistant. The seven-person company — Tempo AI — has spun out, but is still based at the historic research center, and licenses its technology around organizing a person’s day as well as natural-language processing. It’s led by Raj Singh, who previously worked at mobile companies such as Skyfire and Veeker. I talked with Singh about how he’ll stand out from other smart apps — for instance, there’s a very similar smart iOS calendar called Cue — and how he’ll compete as an application maker on a platform that has an equivalent default app (though Apple’s iPhone calendar is woefully underdeveloped). Singh said that his company wants to add more “intents and actions” — for instance, handling scheduling around a meeting by comparing calendars and confirming participants. He also wants to be more anticipatory — so, if a user wrote “lunch” for a meeting with someone, Tempo could pick a restaurant that’s convenient for both. And he’d like to include better ways for employees of a company to use Tempo together.